So you may be confused by the title of this post because you may think that as soon as you become migraine-free you become 100% headache free, right? Well, this may be the case for some, but unfortunately, this was not the case for me. We are all so individual that no journey will ever be the same and that’s ok.
Don’t get me wrong, it felt incredible to not suffer any more painful migraines, and becoming free reduced my headaches tenfold, however, I still had some work to do to in order to become headache free which is what I have been focusing on for the last year. So today I am going to share with you the steps I took to address this and the process that I went through in hope that it can help you on your healing journey. Additionally, if you want to learn how I became migraine free click here. So the best way I can describe trying to overcome migraines and headaches is the same as peeling back the layers on an onion. At first, your pain all merges into one, you have no idea what is a migraine, a tension headache, a neck headache or an anxiety headache and to be frank, you don’t care. However, as you start to heal and overcome one headache type such as migraine, for example, it then leaves you clear to be able to see the next layer underneath and the symptoms you are experiencing. 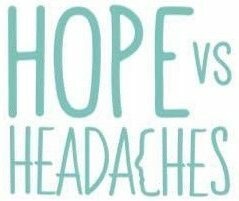 You may be lucky and only suffer from one headache type or you may be like me and suffer from several, but by addressing one headache type at a time, it was able to help me see what I was dealing with and take the appropriate steps in order to heal. So after becoming migraine free, the headaches I was experiencing were mostly tension related. My neck and shoulders would tighten up which in turn would cause me a headache. For a long time, I tried to address this using physiotherapy, however no matter what I did and how regularly I would have sessions, the headaches would always return, which got me thinking; “What is actually the cause of this?” and “where is this tension coming from?”. And after a lot of soul-searching, I realised that I was suffering from a lot of anxiety. Perhaps that could have been the cause? And it was, 110%. So after addressing my limiting beliefs, my cognitive distortions and how to reframe anxious situations I was blown away by the fact that the less anxious I became the less tension I experienced and the fewer headaches I had. The physio had only been acting as a temporary band-aid all along, simply trying to cover the tension on the surface level, but once I got to the root cause, I was able to make permanent lasting changes and prevent the tension and headaches from happening. So as you begin to heal, everything changes and what your body needed to heal your migraines is no longer what you need to heal you other headache types. This is why you have to develop a strong sense of self-awareness and regularly check in with your body in order to find out what it is you need. An amazing tool for this is journaling. Click here to read more about how to journal. By having this evolving awareness and truly being able to tune in and listen to my body, is what allowed me to finally overcome the headache types I was left with post migraines. Don’t get me wrong, I still have a few pesky headaches from time to time but I am human and I will contune to work on this. So my advice to you is to keep showing up day after day, keep doing the work, keep listening to your body and keep putting one step in front of the other because I truly believe that no matter where you are right now, no matter how much pain you are in, freedom is possible. I am nothing special so if I can do it, you can do it too. Previous Entry Could Your Lack Of Boundaries Be Causing You Physical Pain?